Working in tandem with the folks at Washington University in St. Louis’s First Year Center, we’ve helped to enhance the various events where parents and students come together. 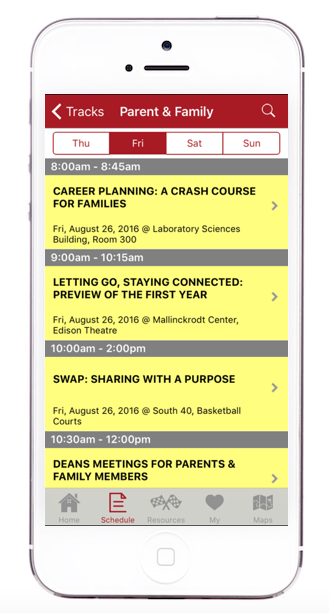 Our mobile event app is helping students and their families acclimate to campus life. The mobile app for the student orientation at WashU and parent/family weekend is chock full of important information. Meeting locations and times, maps of the campus, important campus resources such as public safety, and so much more are included. There’s so much potential to reduce or eliminate paper when these events take place. Sustainability is an important goal on many campuses. Implementing a college event app can help achieve that goal and send an important message to all constituents. Check out our blog post at Unique Venues about how our WashU mobile event app has helped to transform their annual events.